While at Devil’s Lake State Park on a very warm summer afternoon, Rick and I drove by this picnic table. 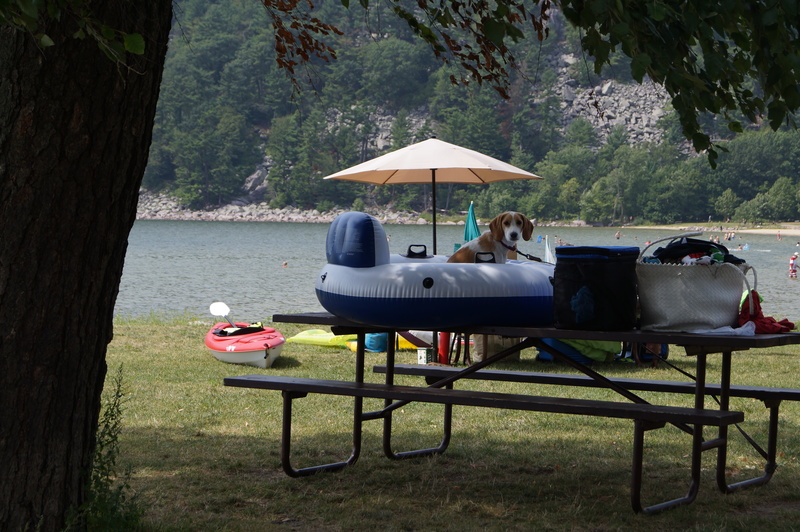 Notice the puppy in the inner tube? She caused us to both laugh. I know it is a she because I overheard her owner’s family call her Lucy. When I was in seminary, I discovered an interesting theological term: realized eschatology. Eschatology is the study of the end times; what might happen with Christ’s return to earth, as proclaimed in the New Testament. While thousands of people have tried to predict and describe this, so far these people have failed miserably. “Realized” changes the meaning. We do not have to wait until Christ’s return to experience some of heaven now. We can begin to experience God, God’s presence and the reward of being a Christian NOW while living on earth. Realized eschatology says we begin to feel and experience God’s rewards in the here and now, not just in the future. At the time, this concept was a breath of air for Rick. It was shortly after Rick’s oldest son was killed in an accident. The days were challenging and sad. When I explained realized eschatology, Rick’s attitude changed. He could either live disappointed with his son’s death. Or he could look for opportunities to see God’s grace and presence in his daily life. He could experience God’s reward for him partially now. While Nate has experienced the fullness of God’s reward in death, Rick and the rest of us have the opportunity to experience some of God’s rewards now. Too often, people choose not to see God’s reward now. They are disappointed and think the glass is half empty. Half glass full people experience God’s kingdom now. In this sense, Rick has Lucy’s life. We choose whether we are content with our position and stage of life or if we allow frustrations to be more important. We determine if events are going to overwhelm us before they happen. Our perspective on life, God and the interaction between the two determines whether we experience a little bit of heaven while still on earth. Rick loves summer. He loves the hot. For him, it is a good day when sweat rolls off of his nose when he is doing nothing. This is a little bit of heaven on earth. For Lucy, it seemed to be sitting in the inner tube. She wasn’t disappointed her new family is off doing some activity while she is tied to the picnic table. She is so excited to be at the lake feeling the breeze. These are her dog days of summer. What is yours? How do you experience realized eschatology? Lord God – Too often we miss seeing the rewards of your kingdom in our daily lives. We tend to focus on what we do not have rather than the goodness before us daily. Remind us anew of the great promise of your kingdom. May we experience this today. Amen. Thirteen years ago today I became Mrs. Dianne Vielhuber. When I entered the ministry, I was not sure that I would get married. Who would want to marry a pastor? I met Rick at my first appointment. God does have a sense of humor! I will never be a mind reader, especially with my husband. Thinking the exact opposite of what I would like him to think is probably closer. If I only had $1 for each time he told me the first years we were married, “But I thought you would just know this.” I still get weekly surprises. Never commit your spouse to something without checking with them first. Your idea of what they should do and their idea are not the same. When something is REALLY important, I cannot expect my spouse to automatically know this. It is much easier to just tell the other person. I cannot change who my husband is. I can only love him the way he is and change myself. Life is really a lot less frustrating when couples respect this. Remember to thank God every day for your partner. Sprinkle your conversations with the words “I love you,” “Please forgive me,” “I forgive you,” and “Thank you” every single day. Seriously, every day. Keep your marriage centered around Christ. When Rick and I include Christ in our relationship, it works much better. Rick is a beloved child of God and I need to treat him this way, even when I want to throttle him. We aren’t set any long-time marriage record. We still learn from each other every week. At the end of the day, I still am thrilled he is my spouse. I chose him 13 years ago. I choose him again today. This is our forever after. Lord God – Thank you for ordaining marriage and providing a way for couples to make lifetime commitments to each other and you. I thank you for the man who is my husband. Thank you for making him unique and special. Help me appreciate this every day. 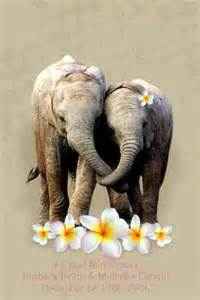 Encourage me be a spouse that supports, loves, respects, honors and encourages him daily. I pray for couples who are struggling right now. Please bring forth reconciliation, compromise and a loving spirit. Amen. 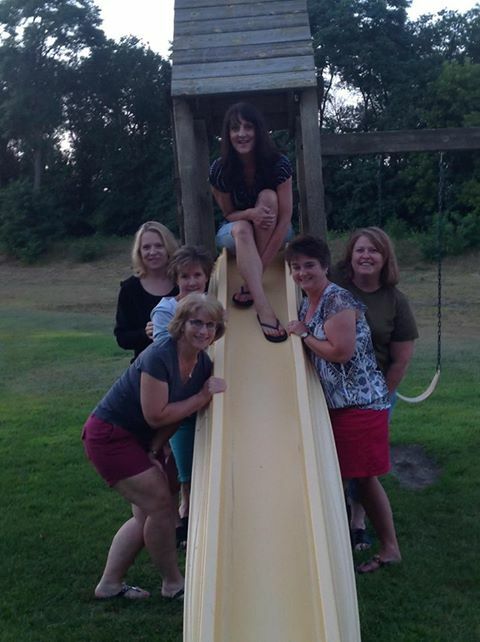 My High School BFF’s – top: Missy; Left of slide: Heidi, Lisa and myself; Right of slide: Pam and Rita. Missing: Monica. Recently, I spent an evening with six of my high school friends. Since several of us have lost a parent recently, I decided it was time for us to get together while not at a funeral home. Unfortunately, one wasn’t able to join us. These girls are my oldest friends. We learned to drive together, played sports together, showed cattle together and went to prom together. Quite honestly, we have not always kept in close touch. The good news is that time has stood still and we picked up right where we might have left off at an earlier time. We had a wonderful time together. I am fortunate. I have friends from lots of aspects of my life: high school, college, work, church, neighbors, mutual friends, etc. As I have matured, I have discovered the great advantage of having friends older than you, younger than yourself and from similar and different backgrounds. This allows a wide variety of people to draw upon in various situations. Friends were important to Jesus. This is why he selected 12 guys to be his new best friends. All 12 did not know each other before they were thrown together into being his inner circle. There were two sets of brothers and they knew each other because they fished together. But the tax collector was not high on a list of someone they should befriend. I’m thinking Judas Iscariot really stood out … and Jesus intentionally did this. Each guy brought something a little different to the group. They help us see that it is not best for a group of friends to be just exactly alike; much like my circle of friends. What Jesus does model for us is that we are not to journey through life alone. Family is extremely important and sometimes they become great friends. But different perspectives is often helpful. I am thankful my friends were able to get together to laugh, giggle and share. We had serious moments and we had gut-laughing moments. I apologize to the woman who was trying to read a book while we were at the next table carrying on. Then again, I think she enjoyed seeing us have fun. Maybe it made her think of her long-time friends as well. Lord God – thank you for the many special people that you have brought into my life. Too often, I fail to thank you for their special unique qualities that I have benefitted from. As Jesus intentionally chose an inner circle, I pray that we make sure and have those special relationships and people in our lives. Amen. Judy and some of the apples I picked. Licht’s roadside stand. Not just apples — also honey! For the Lord’s portion is his people, Jacob his allotted inheritance. In a desert land he found him, in a barren and howling waste. He shielded him and cared for him; he guarded him as the apple of his eye. One beautiful afternoon, I picked apples. Earlier this summer, our brother-in-law Dan died. He raised apples and sold them on a roadside stand by their farm. After Dan’s death, I volunteered to help Judy with the apples. The first variety was ready to pick. For a couple hours, I picked Jersey Mac. As a kid, our family went to an apple orchard near Chippewa Falls on a Sunday afternoon and get apples. Sometimes we picked them and sometimes we took already-picked apples. I remember the smell of the shed, little buckets near the big bushel baskets filled with apples for people to sample the varieties. It amazed me! My experience picking at the Licht’s was a little different. These trees seemed smaller. I draped an apple bucket over my shoulder and carefully dropped apples into it. When the bucket got full, I slide the cords out of little holders holding the open bottom tight. Carefully, I dropped the apples into a crate. 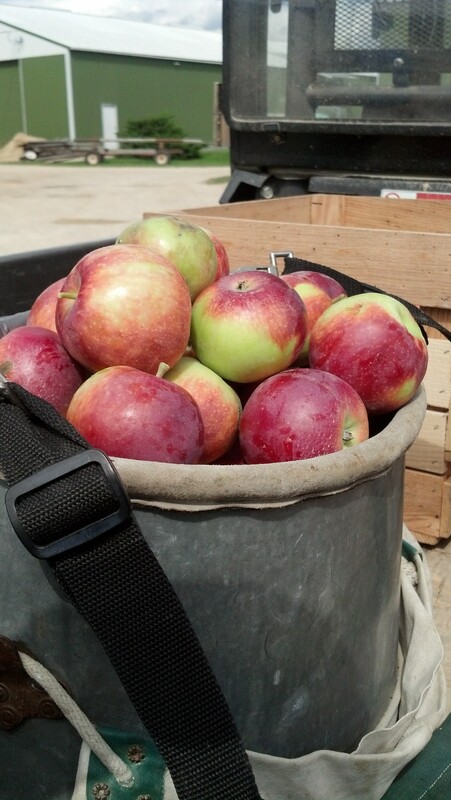 Two apple buckets filled a crate. I couldn’t reach all the apples since I am not as tall as Dan or the man who regularly picks. I backed the Kubota near the trees and stood on the back to pick. It is best to have an empty apple bucket when doing this. As I picked apples, I envisioned families who might buy these apples. 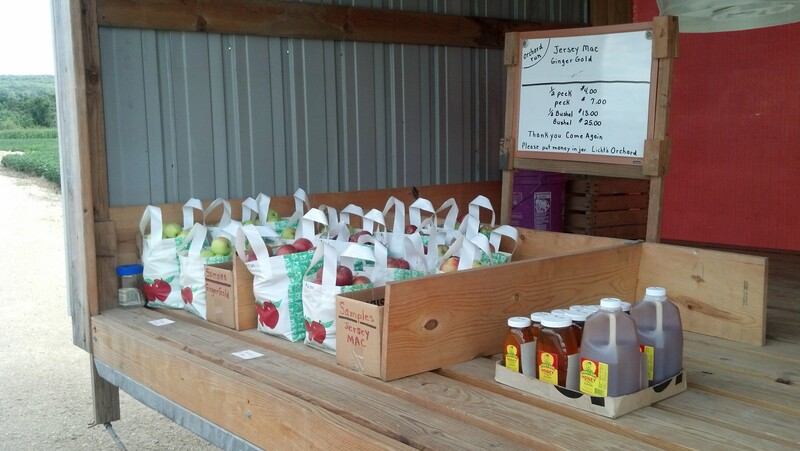 I had a mental picture of customers examining the various bags and picking the best apples. 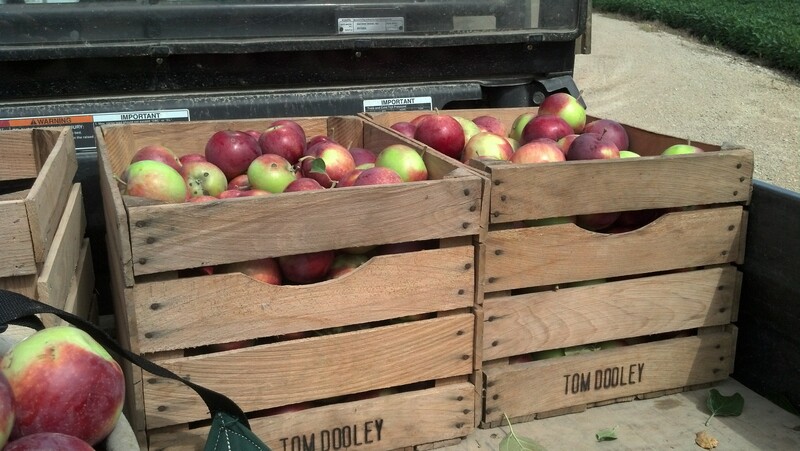 I could smell apple pies, cobblers, applesauce and caramel apples they might become. I imagined families visiting the apple stand as I did as a child. Some apples have scabs on them. My sister-in-law Judy said one man tells his kids the apples with scabs are the best ones and they fight over these apples! Picking apples reminded me of this scripture. I am the love of God’s eye, scabs and all. Just as God shielded and guarded Jacob in a foreign land, God is with us when we feel in foreign territory. We are no less the apple of God’s eye than Jacob or any other person from God’s Holy Word, the Bible. I anticipate picking apples again when another variety is ready. 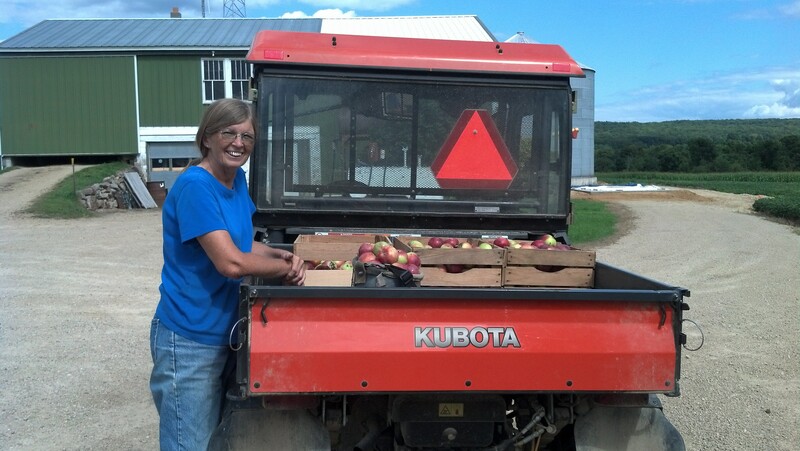 As I pulled away from the orchard with filled crates in the back of the Kubota, I sampled an apple. Yum. These apples are also making good pie and applesauce. Just as there are many different apple varieties, there are countless varieties of human beings. Just as there are scabs on apples, we have our individual scabs from when we have hurt ourselves or others have hurt us. With your grace and mercy, You consider us the apple of your eye. How grateful we are for your great love in our lives. Please wash over us today with your love, support and grace. Amen. I am living the sandwich generation. My week involves helping keep my in-laws in their home, sprinkled with opportunities to help with our grandchildren. This is not a bad place to be. It is where I am. About 15 years ago, I lived overseas as a missionary for a year in Kazakstan and taught English at a university. As part of the former Soviet Union, the people struggled with how to embrace western culture after living under socialism for generations. One thing stood out to me: their understanding of family. While most Americans say family is the top of their priority list, how we live it is different from my experience in Kazakstan. Often three generations lived together in a two-bedroom flat the size of your living room and kitchen. In this space, parents lived with their parents and children, sometimes even a fourth generation. These families wanted their teenaged/young adult children to study English with a native speaker. I’m not sure how some families came up with the $30/month the University charged. But they did. Most students were flabbergasted that as a single person, I lived in an apartment alone and drove my own car. One male student asked me, “How does your Dad fix your car when you live so far away?” The student couldn’t understand why my Dad had not taken care of my car for years. I have thought of Kazak families these last weeks. 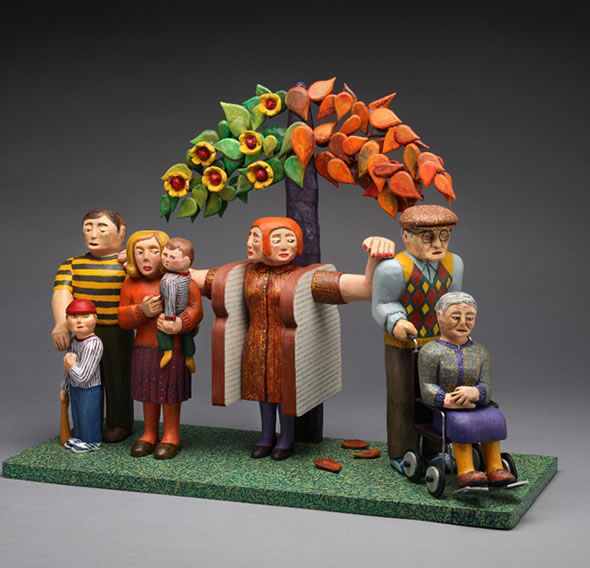 Grandparents often did not work to provide childcare for their grandchildren. Individuals set aside personal desires so a younger generation could have new opportunities. I wonder if their views of family have changed since I was there. Don’t get me wrong. Many American families work hard to have connected families. Parents and grandparents go above and beyond to help. I am not the only person experiencing being a sandwich. I thank God when I see people choosing to be sandwiched. Isn’t God the ultimate sandwich generation? God intentionally choose to be the connecting point between generations. This helps me see how I fit into the larger picture of God’s family that precedes me by thousands of years and may live beyond my lifetime. My role is to honor, represent and model God’s presence in my daily life for those older and younger. I will not always live right, but I try to have glimpses of righteousness in my daily actions. Sometimes, I bemoan that many things I had hoped to get done by now aren’t started. Being the sandwich generation is more important than those projects. There is always winter. Throughout history, Lord God, you are the thread that connects one generation to the next. May we live our lives in such a way that we honor you in our actions, words and deeds. May we seek to make your righteousness part of our families from one generation to the next. Amen. 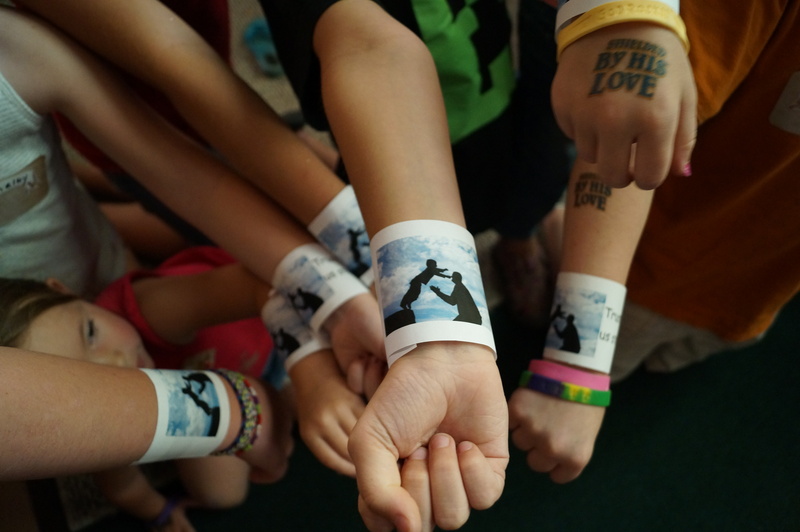 Trusting in the Lord wristbands. 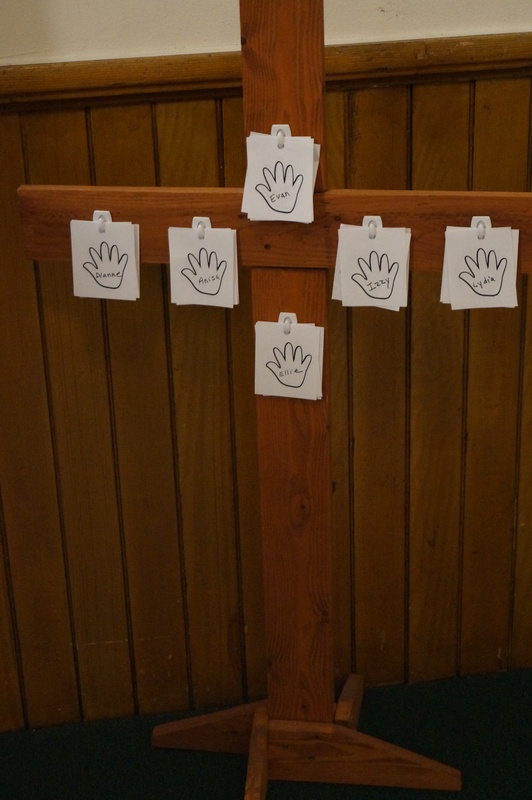 Putting our names on the cross as a reminder that Jesus died for us. Looking into the empty tomb and finding balloons! Aug. 12, 2013 Deuteronomy 4:9 Only be careful, and watch yourselves closely so that you do not forget the things your eyes have seen or let them fade from you heart as long as you live. Teach them to your children and to their children after them. 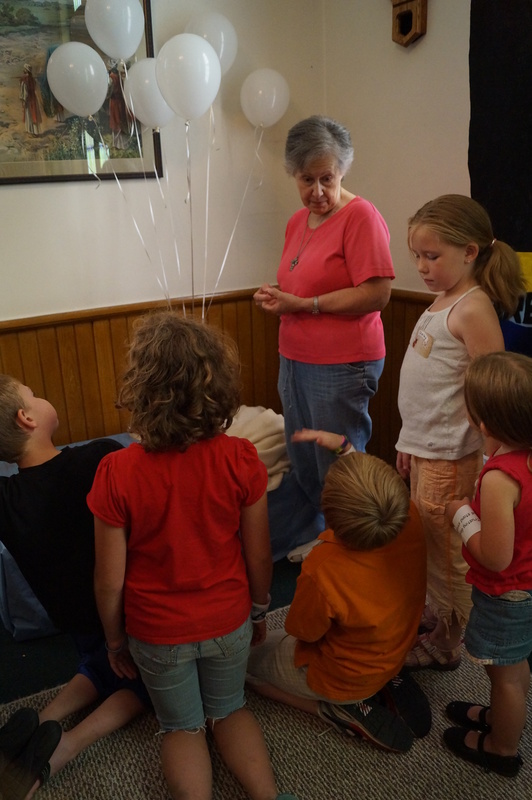 Last week, I took two grandkids to Vacation Bible School (VBS). Waylan, Ellie and I attended the VBS put on by the churches I served in my first appointment. 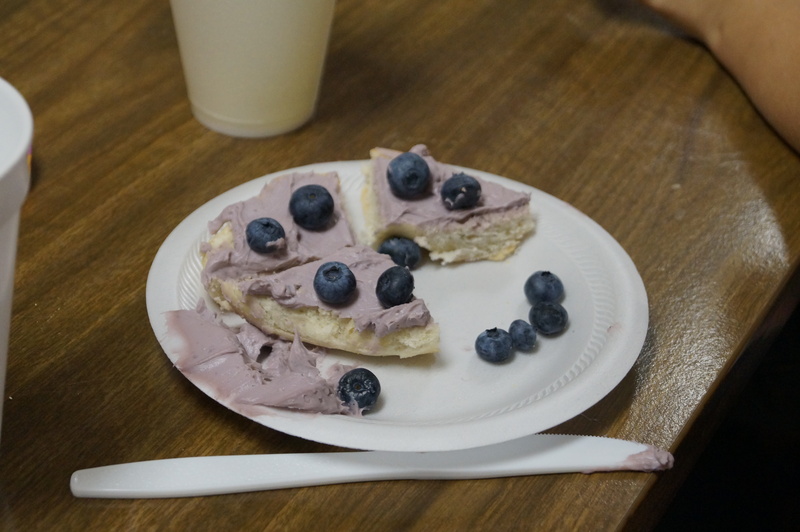 Together, we learned the songs and motions, experienced the nightly Bible story, made crafts, ate snacks (blueberry cream cheese spread on a bagel with real blueberries on top is great! ), played games and watched the Chadder the Chipmunk video, who manages to get into loads of trouble. Since I am not currently serving a church, the experience was quite different! I could show up, participate and enjoy! No making sure everything was organized, the necessary snack items were present, there were no lost kids and that everyone was having a great time. We simply walked in at 5:29 to registration. One night, we arrived a couple minutes late. Pastor Carol wanted to know if I regularly show up for church late. For the last 14 years, either our niece and nephews or our older grandchildren have stayed with us during VBS week. We usually go camping and make it an action-packed week. As I dropped Waylan and Ellie off at home one night, they asked if they could stay overnight with me the following night. The next night we slumber-partied and ate breakfast with Grandpa-Great and Grandma-Great. Every following night, Ellie asked if she could stay with me again. We did have supper with the great-grandparents a couple nights before VBS. And the three of us had an ice cream treat my last night. For Tuesday night, Pastor Carol asked if I would be Queen Ester. While I lack Queen Ester’s beauty, I was happy to help. When I came to the story time dressed as Queen Ester, Ellie said, “That’s Dianne!” The next day while buzzing through the store, a girl from VBS came up and asked if I was going to be Queen Ester again. She and her siblings couldn’t wait for another night of VBS. Is VBS beneficial? I think it is a great and fun way for the kids to learn Bible stories and their points. It’s not a bad venue for older kids and adults to remember these same things. The week was surreal as I watched some kids who participated in VBS while I was serving these churches help as leaders and helpers. Ten years ago, these kids were jumping up and down to the songs, tearing through the church yard during games and the ones I had to quiet down. I am ashamed to admit I didn’t recognize all of them. Whether you were a crew leader, putting on tattoos or helping with the snacks, you made me proud. Apparently VBS was a great enough experience that you came back and make it a neat experience for my grandkids. I think this is super cool. Thursday night was my last night as I had another commitment Friday night. Waylan and Ellie’s Mom took them on Friday, with one of their friends. The friend had such a good time he wants to go next year for the whole week. As we were pulling away from church on Thursday night, I asked Waylan what his favorite part of VBS was. His answer: “Everything.” This is the only thing I needed to hear to know the time and effort was more than worth it. These are the lessons we can all learn from VBS. Lord God, thank you for reminding me of several wonderful Bible stories at VBS last week. I pray for all the kids who came. Create in their hearts a desire to learn more about you. Thank you for the people who helped at VBS. I pray their desire to know you is reaffirmed. For all kids who attended a VBS and for those people who helped at VBS, I pray that through this experience, we once again have learned important lessons about you and your Son, Jesus Christ. Amen. 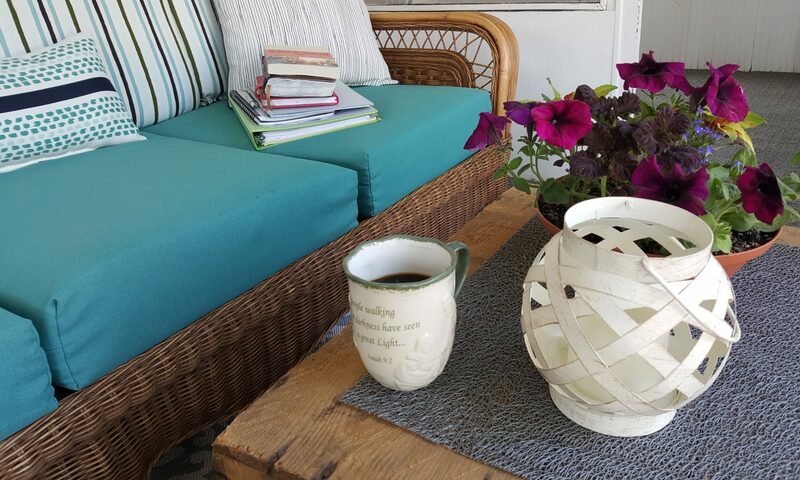 Blessings – Dianne If you have enjoyed this blog, please pass it along to someone else who might also enjoy it. On particular day, I helped with the three nearby grandkids before they woke up in the morning. I went to their house as their parents went to work. When they woke up, I needed to check my mother-in-laws blood sugar. So, we loaded up the car and went to my in-laws house for breakfast. We had pancakes. 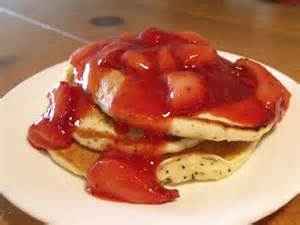 To make it a bit more special, strawberry jam was an option along with syrup. Initially, Ellie was leery of having jam on her pancake. After Waylan tried it and professed it as “really good,” Ellie wanted jam on her plate. A sugar hound, I knew once she tried it, Ellie would decide it was pretty good. By the end of breakfast, the strawberry jam container had diminished significantly. In Psalm 19, King David writes a song about how God’s laws, statues and commands are perfect. In fact, he even says it’s OK to fear God. While God’s decrees are firm, we are not to be afraid of them for they are sweeter than honey, even honey from a honeycomb. Unfortunately, most people do not think of God’s decrees as something as sweet. Rather, we think of them as something challenging and difficult and too particular. It doesn’t help that Christians often cannot agree on what God’s decrees actually mean. Too many times in the last 2,000 years, Christians have spent time arguing about what we disagree about rather than demonstrating the love Jesus so much wanted us to experience. When is God’s law sweet? When we see it as something that God deeply desires for us to recognize as helpful in our spiritual journeys. Yes, some laws are difficult and seemingly impossible to uphold. But if we explore them with the love that Jesus taught us about, then we will see the sweetness in them. Rather than focusing on what separates us or what we disagree about, would it not be refreshing to remember what we do agree upon? This would be total sweetness in God’s kingdom. Lord God, it’s difficult to see your commands as something that really is sweet. We get turned off by your decrees rather than exploring how knowing them can be beneficial in our lives. May we remember that your decrees are always based on love and intended to always point us back to you and your kingdom. Amen. I could not agree more. Many years ago, it was a beautiful April spring day. My roommate, Robin, and I, just wanted to hop into a convertible and enjoy the perfect temperature, the no humidity and little wind. Unfortunately, neither of us felt we could afford to rent a convertible even for the day. We did the next best thing. We went to a car dealership and “test drove” a convertible. The salesperson surmised that we really just wanted to take the car for a spin with the top down. He begged out of going with us, shared that there was more gas than normal in the car and reminded us what time the dealership closed. We took turns driving through the scenic and curvy Sauk Prairie countryside. We giggled until our sides hurt, let the wind whip our hair and smiled until the muscles on our faces hurt. We felt like Thelma and Louise crossing the United States, if only for an hour. I think people who drive motorcycles, experience the rush of riding a pedal bike down a big hill or gallop a horse through an open field also have the same experience. There is just something that makes your face relax into a natural smile that cannot be wiped away when your body experiences the rush of wind. This is the exact feeling Robin and I longed for on that gorgeous spring day. There is another way we can experience this feeling: when we are one with the Holy Spirit. For some Christians, the Holy Spirit is difficult to understand, believe and experience. I think of the Holy Spirit as the voice, whether it be one I hear in my head or one that is spoken to me via another person, that encourages me to do the right or appropriate things. The problem is that I do not always listen to that voice. I am not always confident it is the Holy Spirit or just a fleeting wind gust. When I trust in the Holy Spirit, I can experience a great power that feels as wonderful and refreshing as riding in a car with the top down. Unfortunately, we do not always release ourselves into the power of the Holy Spirit. Whether it is fear, control, lack of trust or confidence, we think we can handle things better by ourselves. Later that day after dropping Waylan at home, I went for a run and saw two convertibles out enjoying the lovely summer evening. As I thought of the joy those two couples were enjoying, a smile crept over my face. I laughed once again thinking of Robin and I wheeling out of the car dealership. I wish we would all seek Holy Spirit as much as Robin and I found a way to go for a ride in a convertible that day. Can we allow ourselves to let the Spirit blow through our hair and plaster a smile on our faces that just cannot be wiped away? Now that would be cool. Please forgive us, Almighty God, when we fail to seek the presence of the Holy Spirit in our lives. We look for other sources of wind and breathe and freedom, rather than keeping ourselves rooted in presence here on this earth. May we all experience a cool reminder of the Holy Spirit this week. Amen. Dad and the “right”color of brown pants at the 2012 Eau Claire County Fair. Today would have been my Dad’s 80th birthday. This past week, I have often thought about what traits my Dad lived that I think were admirable. One that keeps popping into my head was humble. My Dad never drove a fancy truck, owned expensive machinery or had lavish hobbies. He was content on being one of the guys who went to the coffee shop and caught up on the town news. He wanted to blend in. Praise and recognition where not his cup of tea. In fact, this embarrassed him. Last week, I was looking for my Mom’s aqua Eau Claire County Fair t-shirt for her to wear to the fair. I couldn’t find it. I did find my Dad’s 4-H green one. I suggested she wear this, along with a pair of brown pants. It has been a standing joke in our family for years. My Dad would only wear brown pants, except for very rare situations. My Mom bought him pants of other colors, but it was pointless. The color he preferred was dark tan or dark khaki. A regular khaki was too light. Dark brown pants were too dark. His preferred color choice was a narrow range. Thinking back, this color choice reflected who he was. This color blends in. It doesn’t stand out. It matches most any top he would wear. It also reflects how he didn’t want to draw attention to himself. My Mom proudly wore the a ppropriate shade of brown pants to the fair along with my Dad’s Kelly green fair t-shirt. She did my Dad proud. But he is not the person who would have wanted to have something worn in his memory. Today, our society is very me-focused. We focus so much on individual accomplishment and recognition that people have come to expect it. When it is not forthcoming, too often we take our balls and our bats and go home, complaining that someone did not recognize our value and worth. My Dad was by no means perfect. He made mistakes, lacked patience and could have a temper. But when he was wrong, most of the time he was humble enough to admit it. He didn’t do something for recognition but because he believed in the cause. This is the type of attitude Jesus lived and talked about. Dad, thanks for living this example for me. I pray this attribute will be part of my daily life. By the way, Dad, Happy Birthday. Lord God, as we read of Jesus’ life, I pray his humbleness is an attribute we will strive for in our personal lives. Encourage us to be less me-focused. Rather, may our actions, words and lives to reflect your son, Jesus Christ. Amen.